Our shuttle will depart from the end of Skywalk “B” (Level 6, Tower B) in the Hourly Parking Garage. To access this location, take the elevators located between Southwest and Delta (in front of baggage carousel 6) to Skywalk B (Parking). Use the moving sidewalk to the parking end. 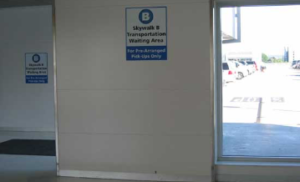 Your driver will meet you at the “Skywalk B Transportation Waiting Area”. We will drop you off in front of the terminal of your departing airline. To access this location, take the elevators located between Southwest and Delta (in front of baggage carousel 6) to Skywalk B (Parking). 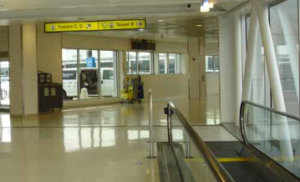 Use the moving sidewalk to the parking end. If you are late, we will wait up to 15 minutes past scheduled departure time only if we have made cell phone contact prior to the scheduled departure time of the shuttle with you, so please include your cell phone number when you call or make your on-line reservation. Our pick up hotline phone number is 410-334-6440. Call this number to get connected to a driver.